If you're looking for a uniquely South Florida gift to give that special someone who has everything, this will certainly make you a hero and thrill your recipient. 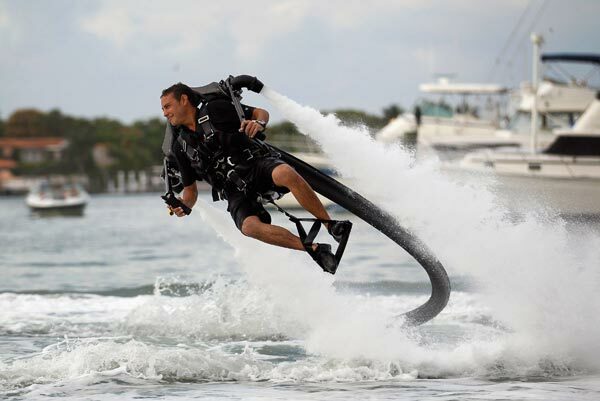 The ultra-cool object of desire is the Jetlev Jetpack, a 1000-gallon per minute adrenaline-inducing tech toy that allows its wearer to soar 30-feet above the water and travel at nearly 25 mph. Developed right here in Dania Beach by Raymond Li, a Chinese-born Canadian, after 11 years of research, the Jetlev hit market in early 2012. At $70,000, you are unlikely to buy one of these, but you can certainly rent some time strapped to one. Located at MM 84 in Islamorada (Postcard Inn), Tiki Jet is a one of only a handful of authorized rental operators in the world. Justin Parrish owns the operation with his brother. 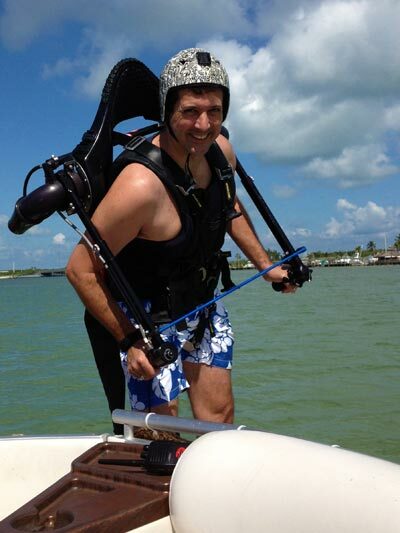 His jetpack rental includes 30 minutes of instruction and 30 minutes of flying. And, Justin half-jokingly points out, you probably want to check your fear of heights and the water on shore. I can tell you from personal experience (thanks for my birthday gift honey!) this is an otherworldly hour on the water. It is Elton John's 'Rocket Man', Tom Petty’s “Learning To Fly” and Steve Miller's 'Fly Like An Eagle' rolled into one. After being strapped into the jetpack, you jump into the ocean with a 55-foot hose connected to what is effectively a Jet Ski engine that floats underneath you and powers your flight. As you fire up the engines, water rushes through the hose and out of dual jets strapped behind your shoulders. With a special helmet on, Justin calmly tells the flyer what to do. You quickly learn how to get yourself half hovering out of the water, then you ‘walk on water’ and after that it’s time to reach for the sky. At one point Justin asks me, “Are you ready to dive?” I quickly learn that with a slight move of my arms the Jetlev can also power your body through the water as a submarine. But there is nothing like soaring with the seagulls and looking back to the shore from about 20 feet above the ocean surface. You feel powerful, majestic and exhilarated all at the same time… and, with Justin helping from the boat, you feel 100% safe. If you are interested in this once-in-a-lifetime experience, you should take advantage of the fact that you are less than 2-hours to Tiki Jet. Call Justin at 305-814-0769 or head to www.tikijet.com. Tell him I sent you and enjoy your ride!